The Real Estate Council of the Miami Beach Chamber of Commerce held the Inaugural Better Beach Awards on March 21st, 2013. Dan Davidson, owner of The Temple House, accepted the “Most Spectacular Restoration” award as part of the televised event in front of a crowd of 300+ people. The Temple House was also nominated for the “Innovative Architecture” award. 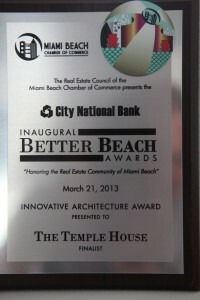 “It is such an honor to have The Temple House recognized and awarded for it’s superiority by the Real Estate Council of the Chamber of Commerce in Miami Beach - a city full of remarkable, historic and unique buildings,” states Davidson. “Over the past several years we’ve put a lot of work into revealing all of the magnificence of the original architecture of this structure and we’ve spared no expense in leveraging new technology to position The Temple House as Miami Beach’s most spectacular & exceptional event space. The Temple House is a luxurious 16,350 square foot private residence and is the largest single-family residence in South Beach. The building was originally designed and constructed in 1933 as a single-family residence by world famous Art Deco architect L. Murray Dixon. It was converted into a temple in the 40’s, expanded in the 60’s by renowned architect Lester Avery and then converted back into a home in 2003 by the current owner, Dan Davidson — who spared no expense in the restoration of this incredible piece of prime Miami Beach Real Estate.